· designed to prevent the execution of malicious programs. It provides more open rules for advanced user customization, which enables the user to define unique defense rules depending upon the special circumstances of his/her own system, thus maximizing the system's protection. · Rising Antivirus comes with an integrated smart virtual machine, which is used for virus scanning and malware recognition. RISING's proprietary smart virtual machine technology provides the additional safety for your computer without slowing down your system. Suspected code and program can be run in this virtual machine for RISING Antivirus to check for potential malicious behaviour. RISING's Behaviour & Packing Pattern Recognition allows to test such potential malware thoroughly without influencing the performance of your PC and protects your system against new viruses and unknown viruses. · can protect specified applications from attack by malicious programs. A user can apply rules to game software, instant messenger, etc. to customize protection. Rising Anti-Virus 2008 provides users with eight rules: Anti-DLL Injection, Anti-CodeInjection, Anti-Memory Modification, Anti-Memory Read, Prevent Suspension, Prevent Termination, Anti-Simulated Sending, and Anti-Simulated Key. · previous versions have not offered complete protection to Rising products themselves, resulting in damage to Rising products by specific viruses such as Orange August. The spread of such viruses has prevented users from running Rising products or to browse the Rising website. We now employ Active Defense Technology to address this omission. · monitors suspicious programs to limit their access to computer resources. · monitors programs running in the system to detect and report the behavior patterns of malicious code, optionally allowing the user to authorize or reject suspicious activity. · can detect processes that cannot be seen in the Windows Task Manager that may contain malicious code, including rootkits. · informs the user of the current security level and guides him/her in strengthening it to prevent intrusions. · provides the following tools: Other Embedded Scan, Registration Wizard, Latest Installation Creation Tool, Application Protection Wizard, Vulnerability Check, and View Quarantine. You cannot download any crack or serial number for Rising Antivirus Free Edition on this page. Every software that you are able to download on our site is legal. There is no crack, serial number, hack or activation key for Rising Antivirus Free Edition present here. Our collection also doesn't contain any keygens, because keygen programs are being used in illegal ways which we do not support. All software that you can find here is freely downloadable and legal. 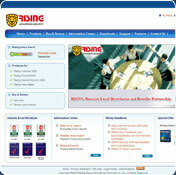 Rising Antivirus Free Edition installation package is prepared to be downloaded from our fast download servers. It is checked for possible viruses and is proven to be 100% clean and safe. Various leading antiviruses have been used to test Rising Antivirus Free Edition, if it contains any viruses. No infections have been found and downloading Rising Antivirus Free Edition is completelly problem free because of that reason. Our experts on malware detection tested Rising Antivirus Free Edition with various spyware and malware detection programs, including fyxm.net custom malware and spyware detection, and absolutelly no malware or spyware was found in Rising Antivirus Free Edition. All software that you can find on our servers, including Rising Antivirus Free Edition, is either freeware, shareware or open-source, some of the software packages are demo, trial or patch versions and if possible (public domain licence), we also host official full versions of software. Because we want to be one of the fastest download sites on the web, we host all the software including Rising Antivirus Free Edition on our servers. You cannot find here any torrents or download links that would lead you to dangerous sites. Rate Rising Antivirus Free Edition 21.22.30.0!